Twice a year Jodi the hostess of the Historic Jefferson TX Ghost Walk tour brings a very special group to town for a day of lectures featuring our history. 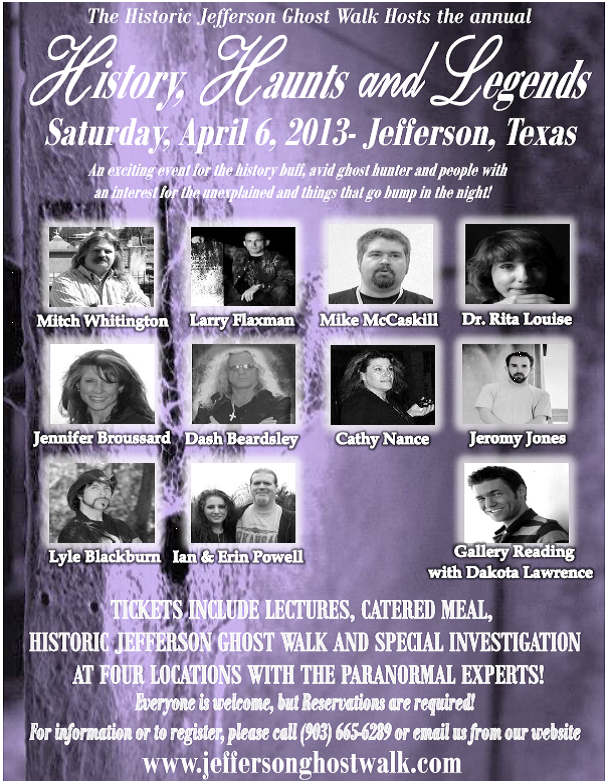 Including the legends of the area and of course tales of the hauntings and ghosts of Jefferson Texas. If you are a ghost enthusiast you will want to be here for this full day of ghoulish excitement. 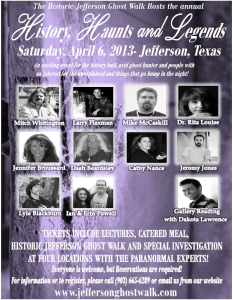 The tickets offered are: VIP TICKET are $75 including lectures, catered meal, historic Jefferson Ghost walk and special investigations at four locations in Jefferson Texas with paranormal experts. NIGHT only tickets are $40. There are a limited number of NIGHT TIME ONLY TICKETS. You’ll want to purchase your VIP tickets on Jeffersonghostwalk.com website. This entry was posted in Ghosts, Spring Events by Tammy D. Bookmark the permalink.